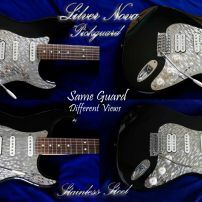 commented on "Black and Chrome Fender Stratocaster Silver Nova Stainless Steel Pickguard Metal Strat Guard"
Silver Nova Fitted to a Strat in Natural Daylight Indoors Setting. Typically Changing Surface Glints Character With Any Shift of Any Light Directions in Ambient light, very Low Light or Spotlight. 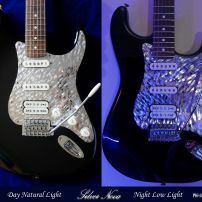 commented on "Silver Nova Fender Stratocaster Stainless Steel Pickguard Machined Chrome Metal Strat Guard"
Silver Nova Fitted to a Strat in natural daylight and low night light setting. A great example of how dynamic and lively a stainless steel guard can be. commented on "'BUFFALO' - HSH LEFT FENDER STRATOCASTER PICKGUARD"
'BUFFALO' HSH - FITTED TO A STRAT FOR DISPLAY PURPOSES ONLY. CLICK IMAGE FOR FURTHER DETAIL. 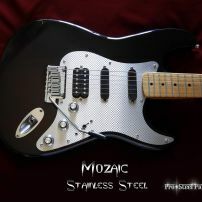 commented on "Mozaic Stainless Steel HSS Pickuard for Fender Stratocaster on Guitar"
MOZAIC HSS - FITTED TO A STRAT FOR DISPLAY PURPOSES. CLICK IMAGE FOR FURTHER DETAIL. 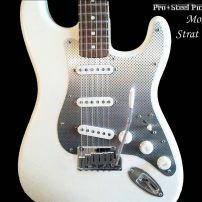 commented on "'MOZAIC' - SSS FENDER STRATOCASTER PICKGUARD"
MOZAIC SSS - FITTED TO A STRAT FOR DISPLAY PURPOSES ONLY. CLICK IMAGE FOR FURTHER DETAIL. 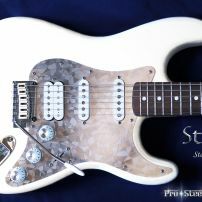 commented on "'STACCO' - HSS FENDER STRATOCASTER STEEL PICKGUARD"
commented on "'STACCO' - HSS FENDER STRATOCASTER PICKGUARD." 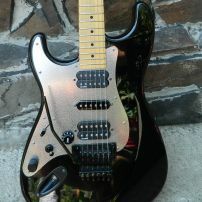 'STACCO' - HSS FENDER STRATOCASTER PICKGUARD. 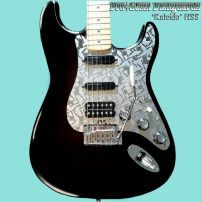 commented on "'KALEIDO' - SSS FENDER STRATOCASTER PICKGUARD." 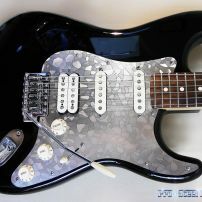 'KALEIDO' - SSS FENDER STRATOCASTER PICKGUARD. KALEIDO SSS - FITTED TO A STRAT FOR DISPLAY PURPOSES ONLY. CLICK IMAGE FOR FURTHER DETAIL. 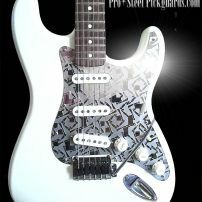 commented on "'KALEIDO' - HSS FENDER STRATOCASTER PICKGUARD"
KALEIDO HSS - FITTED TO A STRAT FOR DISPLAY PURPOSES ONLY. CLICK IMAGE FOR FURTHER DETAIL.